My apologies for being absent from the blog for so long. While my health has been on the decline all year I’ve also been fighting one infection after another since July. This has taken all my energies and then some. I have read your comments and taken them to my heart. Thank you so very much for your kindness. If I’ve not been in touch with you via email, or visited your blogs recently, please know that I hope to amend my ways over the next weeks. I’m now on yet another course of antibiotics. This time it’s a triple punch that I pray returns me to some semblance of ‘normal’. Since being critically ill with septicaemia during my last year living in Bavaria, I am now more susceptible to infection and it takes my body massive doses of antibiotics as well as a very long time to recover from infection. The surgery, which was to be next month, has been postponed until the new year. As my 50th birthday is just a few days before Christmas I’d hoped to be over and done with hospitals by then but it seems I will be carrying this into 2006. Despite the woes, I remain for the most part optimistic and in general good humour. On some levels it may appear as if life is falling apart for me but the truth is I’ve never felt more together. My hopes, plans, and desires for a life lived productively are strong and growing. Life is joy. I feel that. Each day I seek out both new and familiar ways to sustain and delight in the wonders that leave me on the threshold of the sacred and awaiting that next step. That’s what it’s about, isn’t it. Beautiful photo, Susanne, and I am so glad that it sounds like this course of antibiotics is taking hold. Hold the joy, the hope--and when you can't, we--your readers and cyberfriends--will carry it for you. Did you grow these tomatoes? I just breathed a sigh of relief. May you continue to heal and bless us with your beautiful vision of the world and life. You are an inspiration! You are an amazing writer. I just found you. What is going on with your health, that you are so ill? How are your cats? Oh I do hope the antibiotics work quickly and pick you up, so you're in good fettle for the next hurdle. What a lovely photo of tomatoes. Very positive too: don't they just look bursting with healthy stuff inside them? It's good to be surrounded with things like these when you're not well. It's great to get an update from you in any event - I miss you when you're away! Really pleased to have your news, Susanne - the last 4 sentences of your post in particular are so joyful, in spite of what you are dealing with. Thank you for your uplifting spirit. Sorry you have needed more antibiotics but there are indeed times when nothing else will do except large doses of them!! I am just grateful they exist. Wishing you continued joy in searching out things that sustain you. May the Light of beloved Wales continue to shine on you with peace, joy, and love. I have been reading your blog and I am touched by your circumstances. I just turned 50 in October and I empathic regarding your health versus your age. You will be in my prayers for a return to good health. Beautiful picture! This gorgeous red tomatoes reflect your frame of mind: bright, warm and hopeful! Courage, peace, and a way to build up your immune system, dear gods. "You get what everyone gets, you get a lifetime." When I saw the beautiful red tomatoes I immediately felt your optimism, and was very happy. My hopes and prayers for your continued healing and positive attitude about life in the future. Having been ill myself recently, and finding it very difficult, I thought of people who have had more chronic problems, like you, and tried to take heart from them. You have made me appreciate how difficult - and how important - it is to remain positive, and I admire you. Bon courage! It is wonderful that you remain optimistic because that will make your life so much richer, in spite of whatever health problems fate has thrown your way. Take care and get better. Susanne, I hope the antibiotics work quickly and get you back on your feet. You continue to inspire me with your joy. Sometimes those of us with pretty good lives still focus on the obstacles and difficulties when there are wonders all around us to delight in. Thanks for the reminder. Susanne, I can sure tell by your words that you are feeling better. Thank God! I assume you read Shirley McClaine's book about her pilgrimage on the El Camino; I haven't. A pilgrimage book I really like is by Phil Cousineau--The Art of Pilgrimage. He was speaking in Ojai and the end of October but I was just too pooped to drive up there for the weekend. I'm finding I have to pace myself somewhat. His premise is to make ALL travel sacred. As for making the pilgrimage myself, maybe I'm too old, but I don't much about it. I am looking into Bread and Blessings for next year--staying in monastaries and convents in Italy. Maybe we could get some fellow travelers together. There is a pilgrimage in New Mexico from a town to a very famous church called El Sanctuario. Many people do it on their knees. If this triple dose of antibiotics doesn't get the infection your wonderful spirit will. Hold tight and take care. I have wonderful healing thoughts on their way to you... they are almost as rosy as the tomatoes! What a wonderful blessing the world has had... to have you with us for almost 50 years! Good to read you being so positive about life. keep smiling and looking towards the positve. Mouthwatering tomatoes. Just like the ones we grew in our garden this year in Pennsylvania. I'm ready for summer again! New to your blog and glad you're back. Susanne, have a blessed Thanksgiving. Join me in listing your gratitudes on this American holiday. Hope you are continuing to feel well. The tomatoes look delicious...such a simple, healthy, healing food. I hope that many little choices like these fresh tomatoes, and the hopes and prayers of all who visit your blog, bring you healing and miracles. 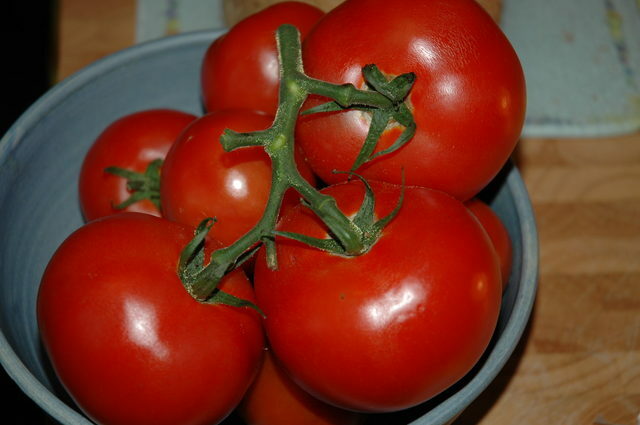 Here's hoping your health in the coming months matches the fullness of your lovely tomatoes.